First things first, a little background on me: I’m a fairly new boater. I’m a whitewater kayaker, but I didn’t grow up paddling. I grew up in a landlocked state with prairie dogs, bison and a small range of granite-studded mountains. I had no idea paddling existed with such popularity in so many parts of the world. Until I moved to Idaho. I hadn’t been before, but I packed my car full of skiing and climbing gear and moved into a room rented from—you guessed it—a boater. In the summer, he’d leave for days at a time to strange sounding places like “the lower Salmon” or “Hell’s Canyon.” After, he’d lay his sopping gear all over the yard and let it bake in the August sun. I didn’t really get it—it sure seemed like a lot of stuff for four days. I once told him it looked like river RV-ing to me. It didn’t take long to learn that paddling is life to a lot of folks though, and soon after that I got sucked in myself. I started with a beginner whitewater kayaking class. 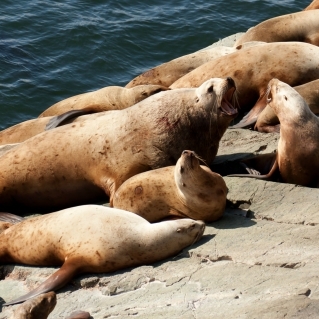 I made new boating friends. Whitewater became a challenge and a goal and I started kayaking more and more. I improved. I learned to roll. I paddled harder, faster, pushier water. I ran little rapids, then bigger ones. 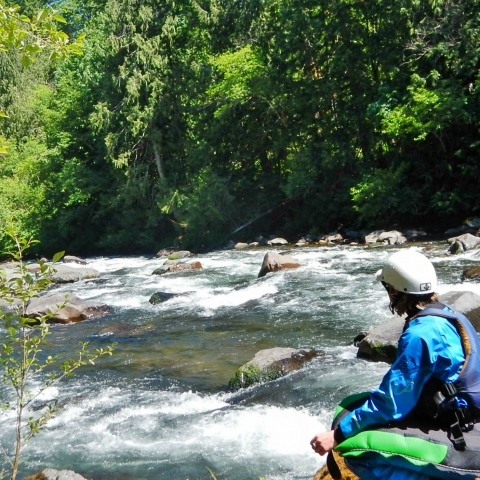 Anyone not in a hard-shell was missing out—I had discovered whitewater kayaking and it was the best. Fast-forward: A couple years and a bunch of river trips later, and a new paddling opportunity presents itself. My first cousin once removed (not kidding, that’s our actual relation) has lived with his counterpart in Juneau, Alaska for over 20 years. 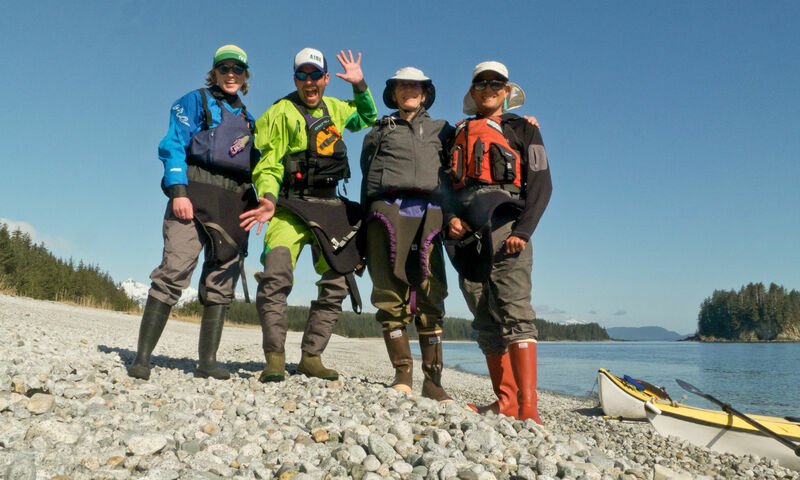 David and Marinke share a huge love for southeast Alaska and for sea kayaking. They’ve invited me up for years to play—ski, hike, paddle, whatever—and this last spring I rallied my favorite paddling partner Kurtis and we finally made it happen. 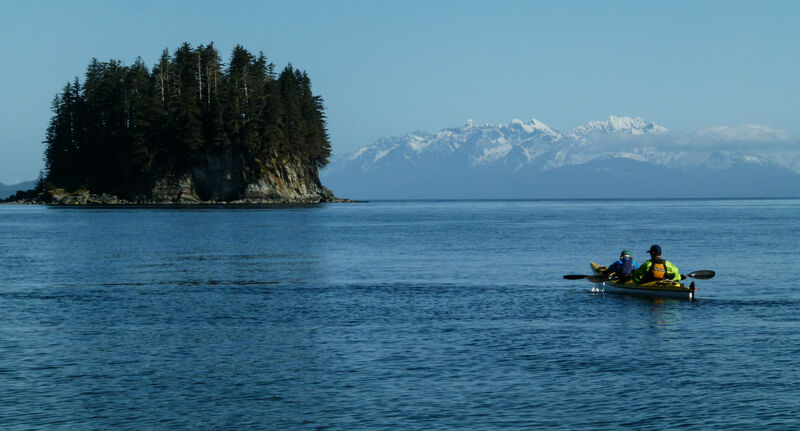 We settled on the first week of May with plans to do a multiday kayaking trip around whatever part of the inner coast had the best weather forecast. I was so freakin’ prepared for this! “I’m a whitewater boater! I’ve taken a swiftwater rescue class! I’ve paddled whitewater days in a row in the snow! Heck, I’m OVER-prepared!” I didn’t pay much heed to the obvious newbie factor: I’d paddled a sea kayak in the ocean exactly zero times. Should be just fine. I packed all my gear and misconceptions into a big ol’ Bill’s Bag and flew to Juneau, where I was in for one of the coolest and most eye-opening paddling experiences of my life. Did you know sea kayaking is a blast? 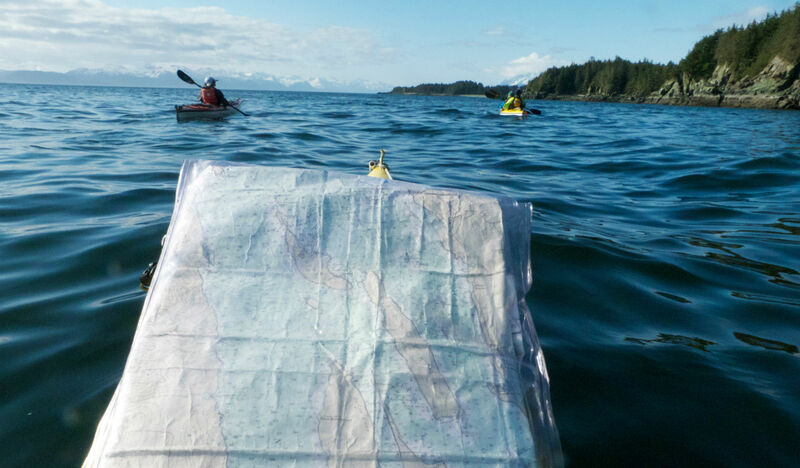 We paddled for three days from Juneau across the Lynn Canal, up the coast into Haines Borough, back across and down. 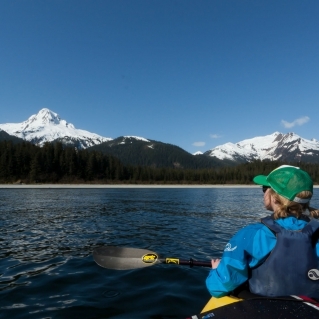 We crossed the deepest inlet in North America, paddled under massive Mt. Golub and camped on beaches along the way. We saw the twinkling navigation beacon built on Vanderbilt reef after the devastating loss of the S.S. Princess Sophia and all its passengers in 1918. We paddled with whales, seals, otters and so many eagles. If I can follow river flows, I can follow tide tables. Nope. If you’re a sea kayaker or a surfer reading this right now, you’re probably laughing at my misguided, landlocked upbringing. Laugh all you want, tides are tricky! They’re faster and more route-altering than I expected, and if you miss your window you can, after a long day of paddling, arrive within rock-skipping distance of the island you’ve planned to camp on and literally not be able to reach it. Thankfully, I had three seasoned tide-readers to help keep track of all those numbers, so I didn’t have to experience that disheartenment. 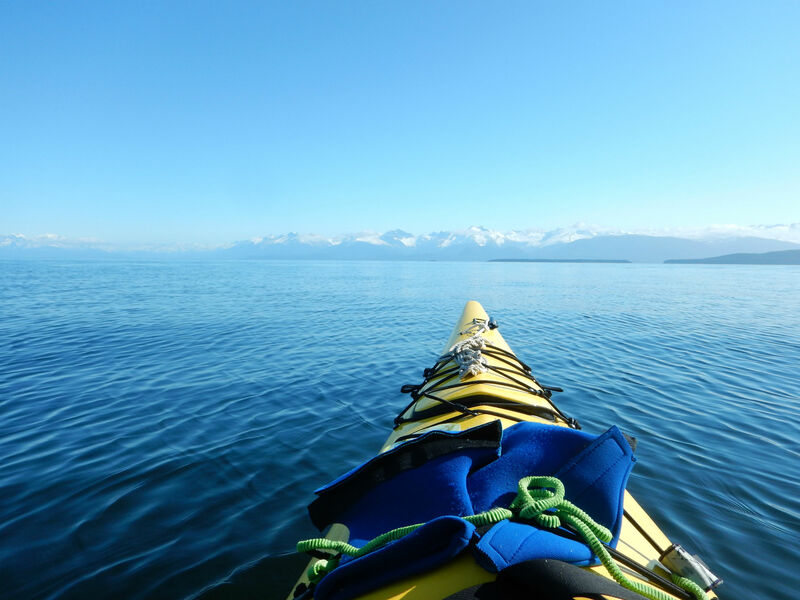 In a sea kayak, I’ll be able to paddle a much longer distance in the same amount of time. Wrong again. My brain took “long, skinny boat” and immediately associated that with the Speed Racer of kayaking. I’d be a blur. No one would be able to keep up. It wouldn’t even be hard. In reality, the miles we made each day were comparable to a multiday whitewater trip, and sometimes even less (you can bet I was just as tired). You don’t have the current of a river to carry you along, and in big open passages, you’re sometimes navigating chop taller than you. The first day, as we looked out across the Lynn Canal, David pointed to our itty bitty lunch beach on the other side and said “aim for that, it should take us about two and a half hours to get there.” I gave him the ol’ smile-and-nod, all the while thinking, “That’s half an hour away, tops. We’ll be there in no time.” Perspective is wonky when you’re looking across miles of ocean, I learned. We did indeed chase that illusive coast line for over two hours. I can just wear all my whitewater gear for sea kayaking. This is probably my favorite one. I’ll be honest—I didn’t want to buy new gear for this trip. I already had a full arsenal of whitewater garb and gosh-darn-it, I was gonna use it. The irony here is that I’ve worked at NRS for five years and I know precisely why some pieces are designed differently for whitewater and sea kayaking. First Time Sea Kayaker Kate asked NRS Kate what to bring, and NRS Kate failed her. 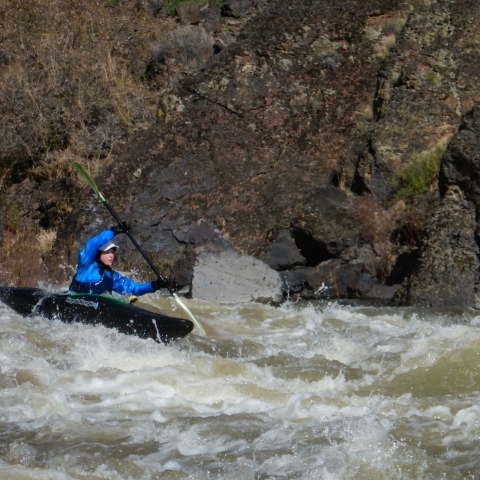 For example: I wore my whitewater PFD. It has a full foam panel in the back that doesn’t interfere with my whitewater boat, but sure got hot after three days in a sea kayak seat. It also didn’t have pockets for things I wanted easy access to, like snacks or my camera. I wore my Flux drytop. It worked fine, but it turns out latex irritates my neck a little more when it’s covered in salt spray. I could have forgone a brutal gasket rash had I opted for something a little softer on the skin, like the neoprene gaskets on our Orion paddling jacket and still stayed plenty dry. I took the gloves I normally wear for cool-weather whitewater and they got tossed in the bulkhead as soon as I realized how often I needed my hands. The ocean breeze was cool enough that I needed something, but I also wanted the freedom to be able to snap photos like a crazed tourist, re-focus binoculars, or futz with my itchy gasket. Can you say POAGIES?! Marinke must have known I was a bluewater newb, because she brought an extra pair just for me. 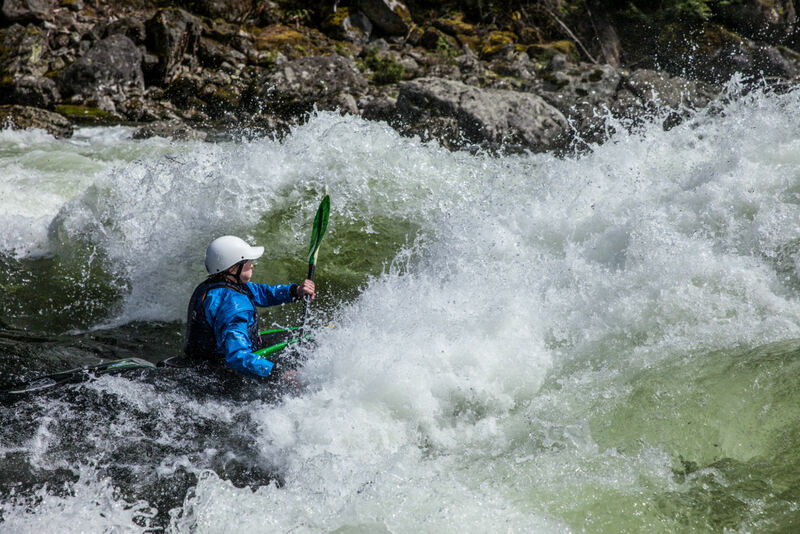 If you can roll a whitewater kayak, you can roll a sea kayak. Okay, I didn’t actually try this one out, but I was surprised by how little outfitting was in the sea kayak I borrowed. Sure, you could add some foam or some knee blocks, but whitewater kayaks come with all that stuff. Here I was in a fiberglass shell with nothing but foot pegs, looking down at my legs thinking, “If I flip, I’m swimming. 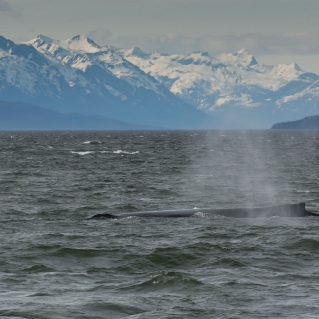 I’m swimming in this cold, Alaskan ocean.” At least I had open-topped rubber boots on. Sea kayaking will be less exciting than whitewater kayaking. I know all of you seasoned paddlers out there already know how false that statement is, but I’ll admit I had that misconception. What I didn’t expect was the vulnerability I felt knowing there was 2,000 feet of icy water below me, with miles in any direction between me and solid land. I also knew we’d see wildlife, but I underestimated how thrilling it would be to paddle with whales and seals. I squealed, laughed, gasped and jaw-dropped more times in those three days than I could have imagined, because I was wrong. Sea kayaking is incredibly exciting. So, dear sea kayaking, I owe you an apology. I underestimated you, and I couldn’t have been more wrong. I’m sorry. It’s not often that ignorance leads to reward, but I got lucky this time and it did. 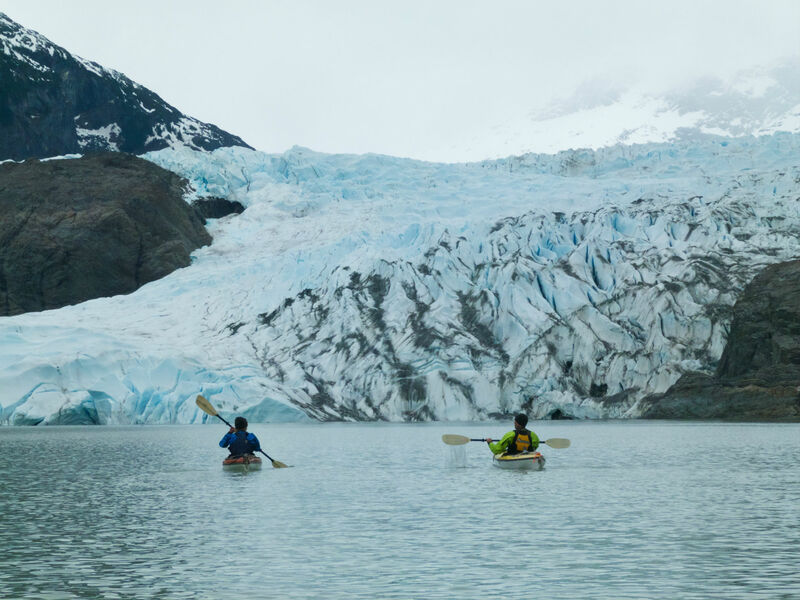 I got a kayaking trip that exceeded my highest expectations, guided by two people who truly love to paddle in Alaska. I got to be a beginner in a boat again, with sore arms and numb feet. I got challenges I didn’t expect, more payouts than I deserved, and I found a whole new kind of kayaking to love.